The Fee Fee Road Bridge was approaching the end of its design life and had to be replaced. Intuition & Logic designed the channel realignment and restoration associated with the new bridge and roadway. Intuition & Logic’s design restored many natural channel functions along 280 feet of channel associated with the new bridge. The design included an overflow internal floodplain using a two-stage channel, natural sinuosity and bend radius based on geomorphic relationships and enhanced the stability of the entire reach by re-establishing a natural riffle-pool sequence. The new bridge, a sanitary sewer crossing and the restored reach were protected from future incision with grade controls. 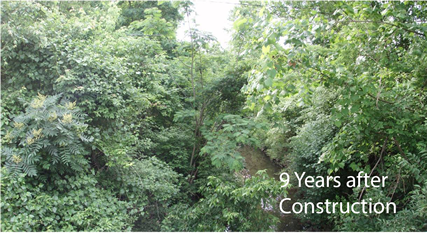 The stream banks were restored with a composite revetment and both the banks and floodplain were vegetated with native riparian species to provide further stabilization, habitat and aesthetic value. 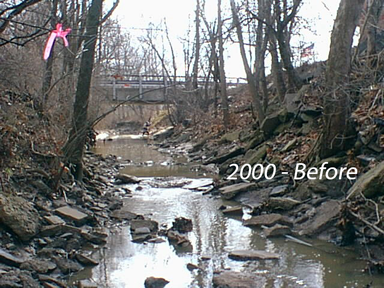 This high energy, urban stream was restored to a more normal, stable configuration with enhanced aquatic and riparian habitat and improved aesthetics.